Great staff Nice and close to all the action which was great. could have easily stayed a bit longer. Clean and fresh! Great place to stay. Clean, fresh and comfortable. 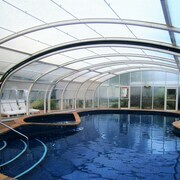 Good pool. Good signage and lovely staff. It was clean and the receptionist was friendly. It was a bit noisy because it is in a very busy area, which could be a positive or negative. The blind over the glass door was not very effective and the room was quite bright. 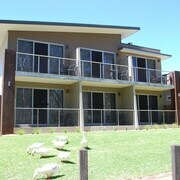 Campaspe Lodge, Echuca Hotel Perfect place to stay in the best part of Echuca right on the Campaspe River. Beautiful surroundings and the room was exceptional..
GREAT PLACE Found this park to be excellent to stay at. Our cabin was in need of some minor maintenance but was very clean. All cutlery etc that was needed was there. I would not recommend using Last Minute bookings. Clean comfortable and low cost. Was exactly what it claimed to be with polite and helpful staff. Well situated but poorly built Nice proprietor, but he's stuck with a cheaply built place that has bad noise penetration. Quit getting the green-eyed monster over your mates' overly-filtered travel pics. With so many different hotels in Echuca on offer, it's your turn to get your own envy-inducing holiday on. 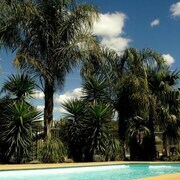 You'll find 48 hotels within 5 kilometres of downtown Echuca on lastminute.com.au. Choice AND convenience? Winning! 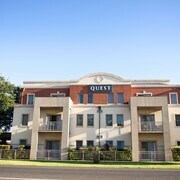 Alleviate your FOMO and take a look at the vibe at the Quest Echuca and the Pevensey Motor Lodge. Both are right in the centre of Echuca. 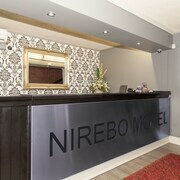 The Echuca Nirebo Motel and the Comfort Resort Echuca - Moama also have some fantastic facilities. When it's time for a tipple, get on over to Chanter Estate Winery and Military Museum. Here, you're invited to sample and buy some first-rate local vinos. 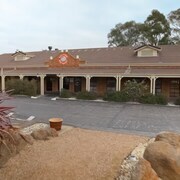 The Discovery Parks - Echuca and Discovery Parks – Maidens Inn should be well up on your hotel hit list if you want to stay nearby. Delve into the natural environments of this region by heading to Banyule Park State Forest. Settlement Motor Inn Echuca and Murray River Holiday Park are two nearby accomodation options if you don't want to stay miles away. "Yaaas"! 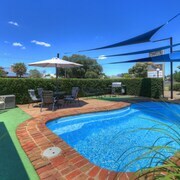 If you need to be budget-conscious, Echuca Gardens is favourably located and has some seriously awesome rates. 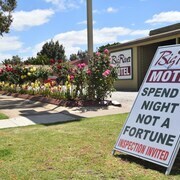 Or, check out the deals at Rivergum Motel. 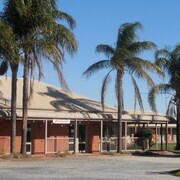 You may also like to try the Discovery Parks - Moama West, which you can find 3 kilometres away. Or perhaps the Cadell on the Murray Motel Resort, just a distance of 5 kilometres from Echuca. If those ones don't float your boat, you might prefer to go with the River Village Motel and Holiday Units or the Riverspa Apartments. Sure, you could spend the whole time just in Echuca, but you're gonna come down with a bad case of FOMO. For some truly epic memories, you've gotta check out the wider Murray Valley region. Open-air markets are some well-known attractions that should be on your cannot-miss list. If the outdoors are more your thang, make a date with Mother Nature and check out Echuca's rural landscapes and rivers. Additionally, if you’ve always wanted to go mountain biking and cycling, you'll have the chance to in this part of Australia. Still haven't got your ideal room? You might just find a lavish enough thread count in Kyabram. You'll also be able to explore Edis Park and the Kyabram Fauna Park. 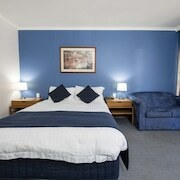 The Kyabram Motor Inn and Ky Country Roads Motor Inn are just some of the great hotel and apartment options here. Or, you could stay in Mooroopna, 60 kilometres to the southeast of Echuca, where you'll find the Big4 Shepparton Park Lane and Paradise Lakes Motel. If you're staying in Mooroopna, set aside some time to visit the Gallery Kaiela and Victoria Lake Park. There's nothing more worrying than taxiing down the runway and wondering where you're gonna stay. So why not get yourself sorted before you leave and reserve a room at the MAS Country Riverboat Lodge Motor Inn? It's seriously close to Echuca Airport which lies 4 kilometres from the centre of Echuca.